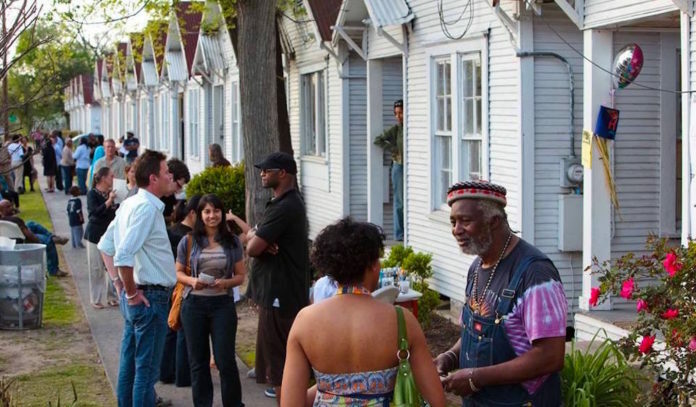 Explore the role of art and artists through community-driven installations, music, monthly markets and more at Project Row Houses. Located in Houston’s Third Ward in one of the city’s oldest African American neighborhoods, Project Row Houses’ goal is to transform the community through the celebration of art and African-American history. Founded in 1993, this unique arts and culture organization have managed to renovate/revitalize 39 shotgun houses into art studios over four blocks of northern Third Ward. Rather than keeping art in the studio, PRH uses art for neighborhood revitalization, historic preservation, community service, and youth education through site-specific installations and programs by artists active in movements around language, identity, environmental justice, affordable housing and more. Today, the organization continues to showcase local artworks while preserving, revitalizing and empowering one of the oldest African American neighborhoods in the city. Tours of the Project Row Houses site are available with weekend docents every Saturday and Sunday from noon to 5pm. Weekday tours are available by appointment. Click here for a list of upcoming exhibitions, programs, and events. Hours: Weekend tours available Saturday and Sunday from noon to 5pm; weekday tours are available by appointment.